With OS X Lion, Apple introduced system-wide support for Emoji characters, implemented on iOS 4's Japanese keyboard last year and recently extended to all international keyboards in iOS 5 beta. Emoji characters are a cute, fun way to share more detailed emoticons with friends on social networks and messaging apps, and because they're based on Unicode, they can be used in a variety of other ways, including domain names. 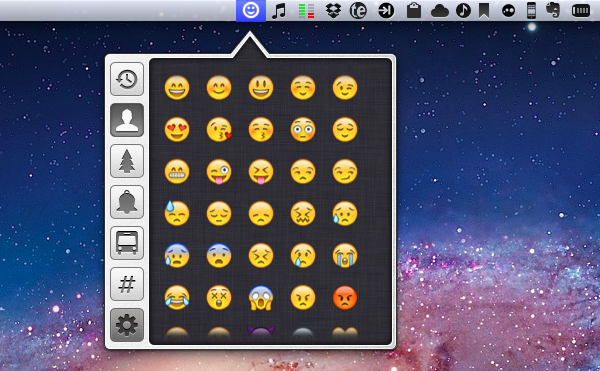 On Lion, users can display Emoji characters and easily insert them using the OS' default character picker; EmojiBar, a $0.99 app available on the Mac App Store, makes emoji-picking even easier by putting those characters right into the menubar, accessible from a popover. 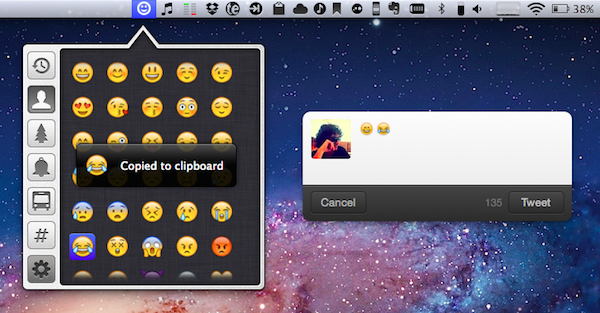 EmojiBar is very simple, and nicely designed: a click on its icon opens the popover, another click on the emoji you need will copy it to the clipboard, and display a notification (notifications can be disabled in the Settings). Icons on the left let you switch between different kinds of emoji characters, whilst the Recents tab gives you access to your most used emojis (presumably your favorite ones as well). I like the app's simple approach and design. I know OS X can accomplish the basic functionality by itself, but it's always nice to see an app doing one thing, and one thing well. You can download EmojiBar here.